For a real, romantic, New England getaway, Maine is the place to be. The state of Maine is well known for its unique and beautiful landscape. Couples can escape their daily lives to stay among the rocky coasts and serine lake fronts. Not to mention, Maine is famous for its seafood: namely, lobster. 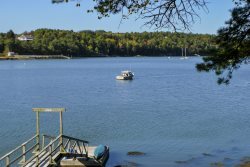 Couples will be able to find a quiet, romantic coastal or lakefront getaway when they stay with On the Water in Maine. On the Water in Maine Inc.